FCC Issues First TIS "Compliance Guide"
WASHINGTON, DC: On May 13, 2014, the Commission issued the first official Compliance Guide intended to summarize the recent Report and Order that clarifies what you may broadcast on a Travelers' Information Station. The American Association of Information Radio Operators (AAIRO) recommends that every station licensee retain a copy of the Guide for reference in the operation of their station. The 2013 Report and Order and the recently released Guide are substantially a result of efforts by AAIRO to obtain clarification on the kinds of safety and emergency content that is allowed on the stations. The FCC documents make it clear that noncommercial messages on the stations must relate to travel, emergencies or situations that present an imminent danger to the public. The FCC affords local public safety officials who operate the stations discretion in determining how various messages qualify according to the standards. Information Station Specialists has updated its Permitted Content page, intended to aid station operators in understanding the clarified content standards. Information Station Specialists introduced the “TIDE” acronym (Travel, Imminent Danger & Emergencies) to assist the clarification effort. "...more of what you call a guideline than actual rules." 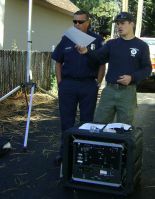 San Marcos Gets 'Em "Outta Harm's Way"
RadioSTAT systems can broadcast recorded messages or even live ones in active fire situations where conditions can change suddenly. Local residents were able to listen to instructions over the 1610 kHz radio signal, as they lined up to evacuate – a process that made a 15-minute drive take up to 3 hours. The Cocos Fire caused an estimated $2 million in damage – a figure still considered preliminary. Click map below for closer view. NEW YORK, NY: The Source recently reported the mysterious interruption of service at New York City’s NOAA Weather Radio Station at 162.55 MHz VHF. KWO35 went off the air abruptly and without explanation last summer, leaving citizens, mariners and aviators – as well as dozens of area Information Radio Stations – without a source of daily weather info and 'All Hazard' warnings. The interruption lasted throughout the fall and winter – a winter during which the station’s services would arguably have been most needed. Hopes were raised when the weather station reappeared at full strength the last week of March … only to again disappear in May. This time KWO35 went dark just as a thunderstorm watch was being issued. After the most recent failure, the National Weather Service did make arrangements for New York City and Northern New Jersey weather warnings to be sent over NWS stations located in Howell and Sussex Counties and the station at Mount Holly, New Jersey – stations the public cannot receive in much of New York City and Northern New Jersey.